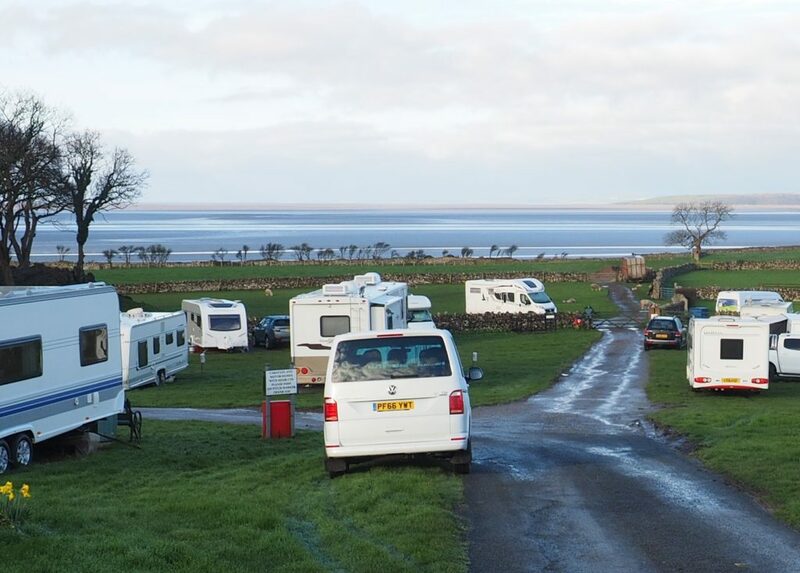 Head towards the Lake district, turn left just after Morecambe and keep going until you reach the coast. Just an hour away Gibraltar Farm is an easy run for us, well an easy run until the last mile or two when you do encounter some narrow country lanes, we got there without incident though. We had also planned our route ahead to avoid a low bridge (a 10ft arched bridge on Borwick Lane – continue on the A6 to Nineteen Acre lane and pass the railway under a 16ft bridge). 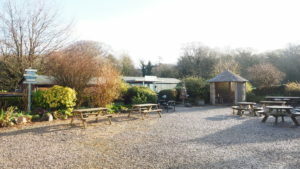 We drove slowly through the working farmyard and as we cleared the farm we got our first view of the campsite. A really nice site, spacious and well laid out, spilling down the hillside and levelling out into pastureland before reaching the coast. A lovely looking site but could I find an office to check in or a warden – nope. To make things worse, every time I slowed down or stopped there was a little red car in my mirrors mimicking my every move! Several times I pulled over but had to say “I’ll have to pull off again I’m in this cars way” and so it was till I came to the end of the campsite. The red car was still behind me so I left the MH and walked back up the hill to enquire about checking in at the farmhouse. They told me Amy ran the site and would probably be in the amenity block at this time. I walked back down, found Amy and settled on a pitch for our van. As I’m walking back the red car pulled alongside “Hello, have you camped on here before?” “No” I said. “Oh isn’t it lovely we were just having a drive and thought we’d have a look” I said “Yes it is lovely, though I’ve been dodging your car for the last ten minutes!” “ha ha bye love” and they were gone. I didn’t bother waving. Heaven knows how they got t his big boy here! They have lost the plot here at Gibraltar Farm, although the plots are spacious, clean and fully serviced they are not connected to the roadway. You have to drive across grass to get to them! What were they thinking? Anyway, I’d told Amy I didn’t fancy driving across any of her lawns and she had asked if we minded being in with the sheep in the bottom field. 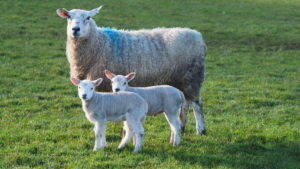 “Not at all Amy that’s great.” She unplugged everyone’s electrics in the last row of the main field and moved them “one along” so that we could run a cable over the wall and have the end mains unit and there we were – in with the sheep. We’d just got sorted when I remembered water! Seems to happen every time, but always for a different reason! Since we weren’t on a proper pitch we didn’t have a tap. Fortunately I had my super long expanding hose and it was long enough to reach the nearest tap. Unfortunately the click-on end wouldn’t stay connected and I had to hold it on using my super strength. Even more unfortunate I’m a wimp so the hose came disconnected half a dozen times and I started this camping trip much like all the others, sopping wet! Once we were sorted out we had a quick soup and a sandwich before heading off to check out the beach with Muffin in tow. A five-minute walk across the field brought us to the beach. Quite a big cove! 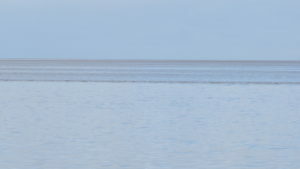 Morecambe bay is absolutely massive. I believe you can walk to Blackpool or something but you need a guide, as it’s also treacherous with unpredictable tides and quicksand too. I didn’t have my camera with me as there was no light. 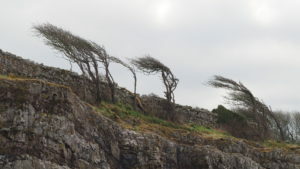 It was the dullest day for a long time and dusk had been brought forward a couple of hours. Muffin had a good run round though, she loves a sandy beach, but we soon learned that the tide was coming in. A hundred yards ahead of us water was running in fairly fast in a right to left direction. Behind us water was running in pretty fast in a left to right direction. I can see why you have to be careful out there! 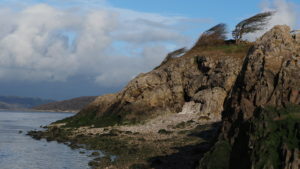 We returned the next morning when the weather was better but the tide was in and there was no beach to explore. A few shots of the beach. It would be nice to re-visit and have time to explore a little more. It was fun sharing a field with the sheep. 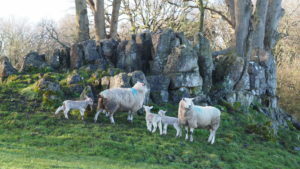 Each sheep had two little lambs and they were quite curious about the motor home. 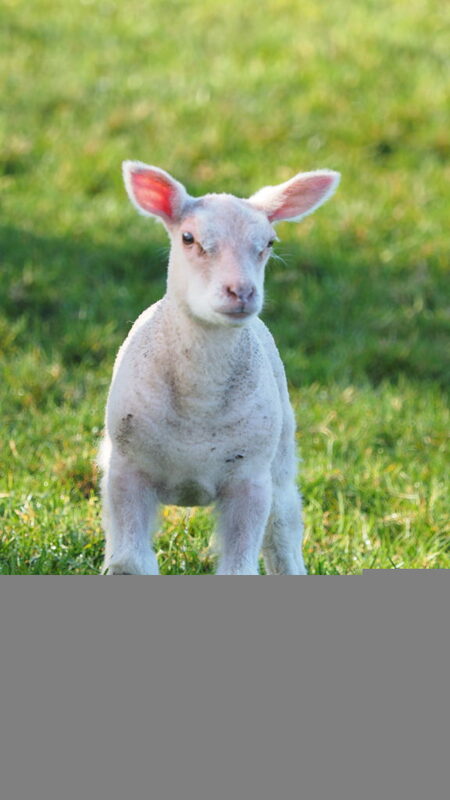 Every time we popped out a dozen or so little lambs would scatter, stand looking at us then creep ever nearer until their mums shouted at them. When they weren’t creeping up on us they’d play running full pelt along the edge of the field, jumping in the air and hopping over one another, quite funny to watch. 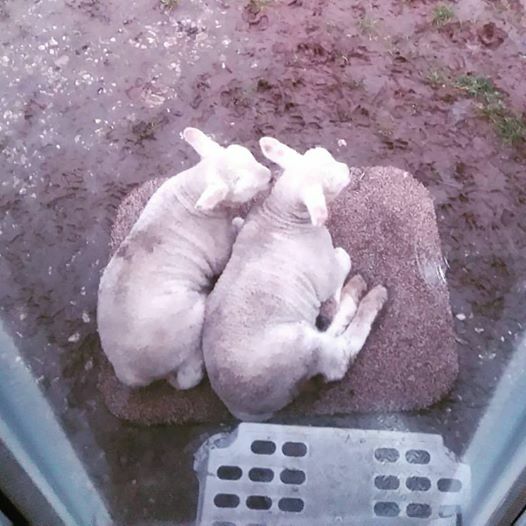 This was our doorstep first thing in the morning, two little lambs cuddled up on the mat. So there you have it. We were only here for one night to give the MH a run out and see if we’d remembered everything. It’s a lovely site with nice clean facilities and fully serviced pitches with plenty space but the trip across grass to get to the hard standing puts us off a bit and I don’t think we’ll be back until that’s sorted out. Since we were only here overnight we didn’t get to try a trip into Silverdale, which is only half a mile away and has a pub and a restaurant. 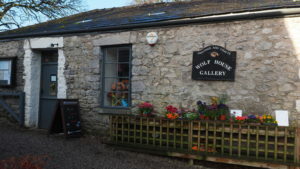 We didn’t even get to check out Wolf house Galleries which are just opposite the campsite and comprise a small courtyard with two galleries selling arty, craft type merchandise, a bakery, and a café with seating in the garden too. Perhaps if they sort out the hard standing issue we’ll return for a longer stay and explore the area. 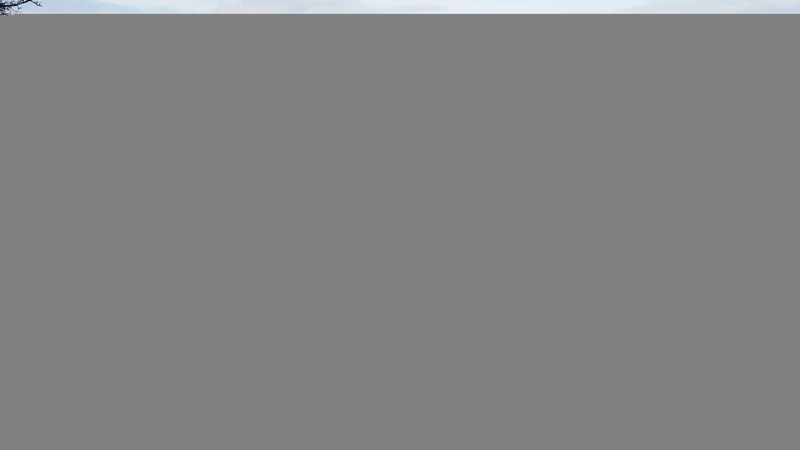 Leighton Moss Nature Reserve is only a mile away too so there is plenty to do in the area. Come on Gibraltar Farm get your pitches sorted out. Well more to the point what hadn’t we learned? We hadn’t learned that you need to sort water out before getting your MH unpacked. 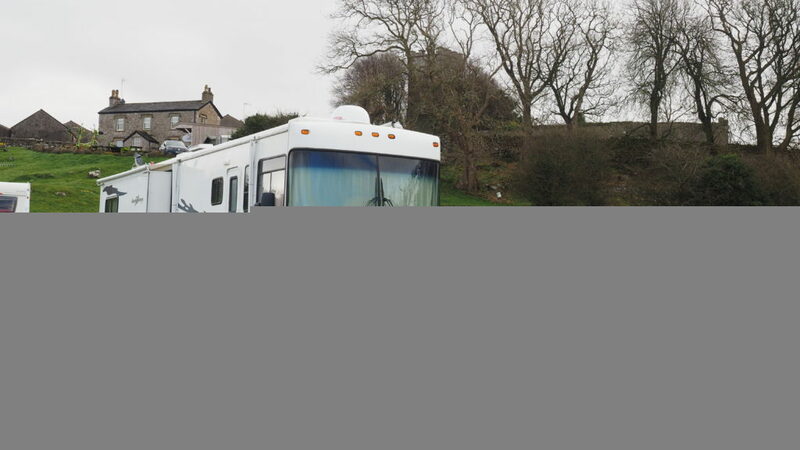 I don’t know if I’ve mentioned this before but we made a checklist of everything you need to do when packing up your motor home ready for the trip home and return to storage. For some reason we didn’t refer to the list on this occasion. We were halfway home when Lesley remembered that we hadn’t closed the skylight. 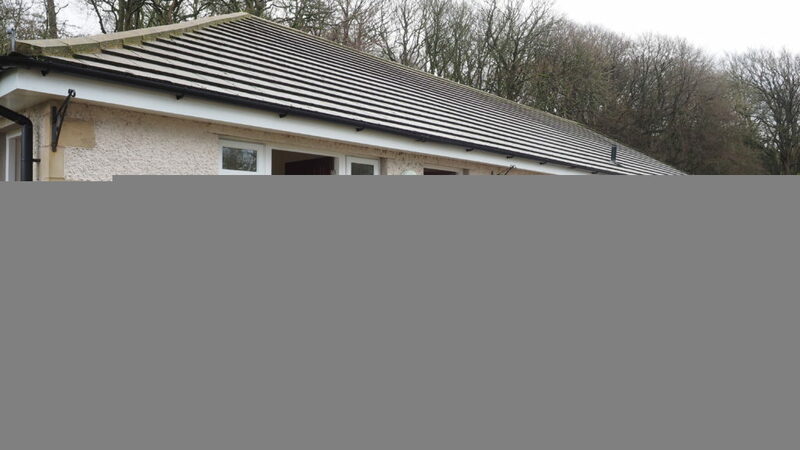 An easy way to lose your skylight or face a costly repair. I was for continuing the journey as we were halfway home but Lesley convinced me that was silly so we pulled into the services and closed the skylight. Just shows there are so many little things to remember.